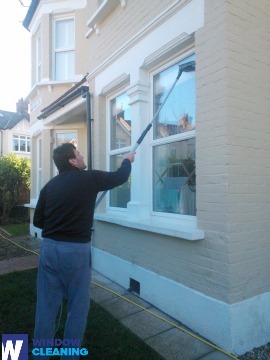 Do you experience challenges with the process of window cleaning around your property? Your struggles are not enough to remove stains, water streaks and dust build-ups from glass surfaces? The professionals of window washing in Southgate will render you assistance! Say goodbye to the innumerable hours of polishing and wiping – the skilled and experienced team will deal with this problem. You will be able to make the most of your extra time – just let us do this slow and tiresome task for you. Our professional approach will grant you lots of benefits. We also provide our professional services in nearby areas: Bowes Park, Palmers Green, Grange Park, Winchmore Hill, Osidge. The employees have the experience and the necessary equipment to provide you with both private and commercial window cleaning. You can rely on us for all types of glass surface cleaning. For instance, we can polish small or double windows, sash ones, French doors, patio doors and bay windows. In addition, if you have garden glass surfaces, conservatory or skylights, we can clean them as well. We use the most advanced methods and the most advanced equipment for all the aforementioned types of windows. Improve the look of your property – the specialists of commercial window cleaning will see to that. As part of our specific service, we use water-fed extension poles. With this technique, we can clean thoroughly the exterior of your office, as high as the fourth floor. To reach higher windows we use rope access. We grant your windows will look perfect, regardless the high of the building. With the assistance of the team of specialists London's skyline shall never be dirty. We provide residential and commercial window cleaning by using efficient approach. You can rely on our expertise for all types of glass surfaces, skylights and greenhouses. For windows placed up to your fourth floor, we use water-fed extension poles. This technique is handy and allows risk-free cleaning systems – the poles are attached to the water reservoir in the van. For higher window surfaces, our rope access team will grant you fast and great end results. You can gain a lot from these techniques right now – just dial 020 3746 3113 and book a window cleaner! With our fast and efficient residential window cleaning in Southgate, you will boost the look of your home at once. We utilise purified water for inside and outside cleaning of your windows. We make this possible by using ground based water-fed extension pole system, which is safe both for your home and the cleaners. Get more information – call us on 020 3746 3113 or complete our online booking form. For your convenience we have a chat facility. Our assistants are active 24/7 – you will get answers to your questions. You can be one of our satisfied customers now!